Yes, we’re glad to say we can be of help to you. Our BP PRO Series could be of help to you. Contact us for help with your product selection – call toll free anywhere in North America, 1-800-626-0664 or fill out the contact form below. 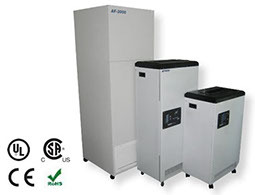 For spaces up to 1200 square feet (based on up to 10 foot high ceiling), we have a BP PRO series air filtration for you. 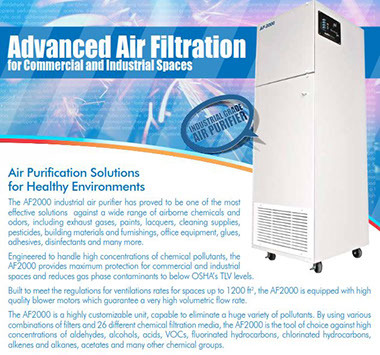 Whether you need to reduce the airborne dust particulates in your indoor air, or reduce the offensive and harmful odors in your work environment (from chemical fumes, chemical off-gassing, fragrances, strong food odors, etc), or both airborne particulates and odors – we have an air filtration configuration that’s right for your needs. Call us or message us for help with your product selection. DuPont™ Delrin® acetal homopolymer resin is a highly-crystalline engineering thermoplastic. Our Laser Fume Extractors generally come with deep bed chemical filtration (we have one that’s 8” deep, one that’s 15” deep) loaded with our general purpose chemical media blend. For most applications the general purpose blend would suffice. If you’re cutting materials such as Delrin you will most likely require a special combination of chemical filtration with a mix of chemical media blend to be effective in dealing with the fumes produced in the process of cutting Delrin. 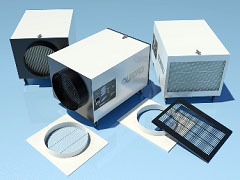 We suggest you let us know what materials you work with in order for us to provide you the best recommendation for your air filtration, fume extraction needs. 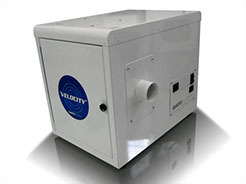 Effective laser fume extraction is critical to laser systems due to the possibility of toxic, carcinogenic corrosive or extremely odorous contaminants that can be generated. 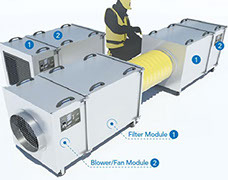 All of our laser fume extractors feature multi-stage filtration incorporating a 2” Pre-filter section, 2” Certified HEPA filter and deep bed activated carbon modules.